Krailling, July 10, 2015 – EOS, the global technology and market leader for high-end Additive Manufacturing (AM) solutions, has entered into a strategic cooperation with GF Machining Solutions, the Swiss based industrial company GF (Georg Fischer), Schaffhausen, to offer customers innovative solutions combining both companies’ technologies. The additive manufacturing technology offers for such customers the possibility to generate metal inserts featuring cooling close to the surface, thus allowing for a shorter mold cooling sequence and therefore a much faster plastic injection cycle. 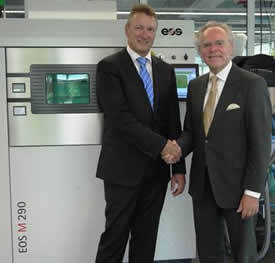 “The cooperation allows us to increase the value for customers by integrating conventional and additive technologies. This is a large step towards seamless production and we join forces with a strong and experienced partner.” says EOS founder and CEO, Dr. Hans J. Langer. This entry was posted in News and tagged CEO Yves Serra, Dr. Hans J. Langer, EOS, Georg Fischer, GF, GF Machining Solutions by david. Bookmark the permalink.